'Working my way back to you' was written by Sandy Linzer and Denny Randell. It was originally recorded by The Four Seasons in 1966, becoming a top 10 hit in the USA, but it was less successful in other territories. 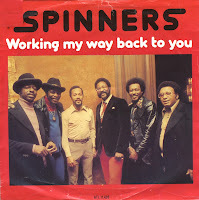 In 1980, The Spinners' medley of "Working my way back to you' and Michael Zager's 'Forgive me girl' topped the UK singles chart for two weeks in April. In the Billboard Hot 100 singles chart and in the Dutch Top 40, the single peaked at number 2.